I’m pretty sure that every time I make a new cookie recipe, it immediately becomes my favourite cookie. Does anyone else have a touch of the Januaries? Please can we talk about Christmas now? I know that it’s not quite December yet and I haven’t even cracked out my winter coat yet but I don’t think it’s ever too early to get into the holiday spirit. And by holiday spirit, I mean homicidal urges and a hatred for all of humanity. Christmas is a really special time isn’t it? This weekend I started my Christmas shopping in earnest. Saturday morning found me and my mother wondering around Forever 21 on Oxford Street looking dazed and confused as we attempted to find some clothes that a 12 year old would deem acceptable. I had planned to continue with my mission and hit a few other shops but there were just people. Everywhere. Walking so slowly. Getting in my way. Queuing at the tills I wanted to use. How dare they! Within about ten minutes, I knew it was a bad idea. I could feel myself getting all hot and flustered and my blood pressure was spiralling dangerously out of control. It just all become too much for me and before I knew it, I was abandoning my shopping basket in the middle of the store and fleeing as fast as I could, throwing old ladies aside as I raced for the exit (I didn’t really, I promise). After spending the rest of Saturday lying down in a darkened room, I was determined to conquer my foe the following day. And conquer it a jolly well did, if the sound of weeping from my credit card this morning is anything to go by. Two hours later, I had crossed off most of my list and had even managed to sort out presents for some of the more difficult of my acquaintances. Oh and I accidentally purchased some sparkly shoes too. No idea how that happened. All of that shopping really took it out of me though. My boyfriend was working all day so I had to actually carry all the bags myself! The horror! It was very fortunate therefore that I had all the ingredients on hand for a restorative alcohol-laden hot chocolate. I think these should be a compulsory part of the Christmas shopping experience. 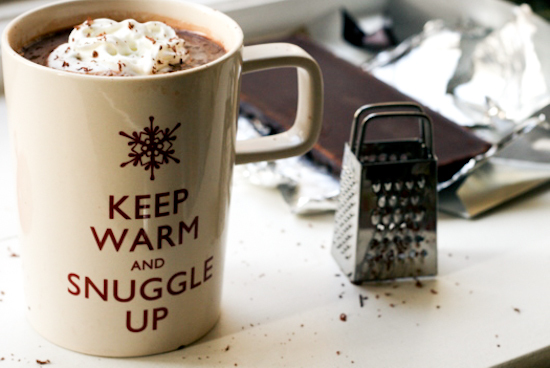 The hot chocolate itself is very simple. Heat your milk until just about boiling, add some dark chocolate and stir it until melted. Add sugar to taste and you have a fairly decent drink. What elevates this hot chocolate though is a generous punch of salt, a good glug of caramel vodka and a spoonful of double cream at the end. 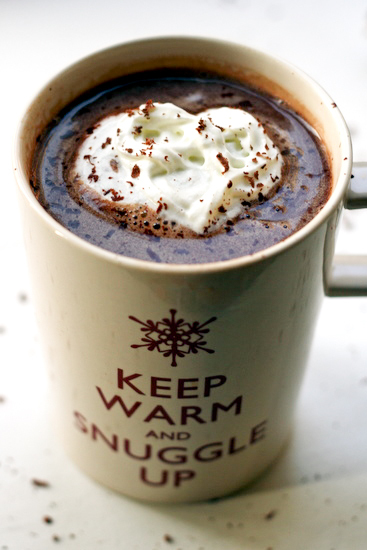 Top with some more cream, obviously, and a grating of chocolate and get ready to drink away your holiday stresses. Heat the milk in a small saucepan on the stove until it’s just about to boil. Take it off the heat and add the chocolate and the salt. Stir with a wooden spoon until all the chocolate has melted and the mixture has thickened. The smaller your chocolate, the easier this will be. Add more salt to taste. When all the chocolate has melted, stir in the vodka and the double cream. 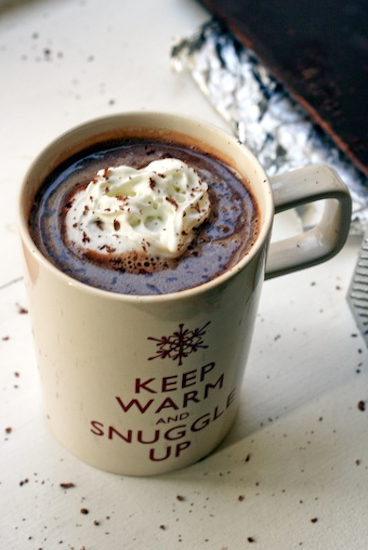 Pour into mugs, top with some whipped cream if you want and enjoy. UPDATED: So many people have asked about the mug and grater that I thought I’d put the answer in the post. They’re part of a set from Marks and Spencer, a UK department store. They are available online although delivery is only to the UK so if you’re overseas, you might need to find a friendly British person! These are probably the best chocolate chip cookies I’ve ever made. 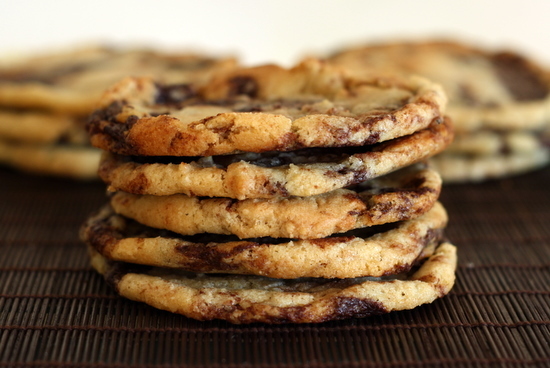 Actually, they’re probably the best chocolate chip cookies that I’ve ever eaten. They almost made me cry chocolate chip flavoured tears of joy. I have been wanting to share this recipe for over a month now. When I knew that a new site design was on the cards, I decided to save them. It was like having a burning secret which you can’t tell anyone and you’re worried that every time you open your mouth, it will just tumble out. You have to trust me with these cookies; I know they look like a bit of a faff what with the whole make-your-own-chocolate-chips thing. I promise it’s not that difficult though and the results are so worth it. Rather than having hard little nuggets of overcooked chocolate, what you have here are swirls of chocolate truffle. And you can flavour the chocolate truffle however you want; the possibilities are endless. It’s really not hard. All you have to do is melt some chocolate, mix it with cream and golden syrup (potential substitutions here if it’s hard to come by) and freeze it. Once the mixture is frozen solid, you chop it up and keep it cold until you’re ready to throw it into your cookie dough at the last minute. Simple. 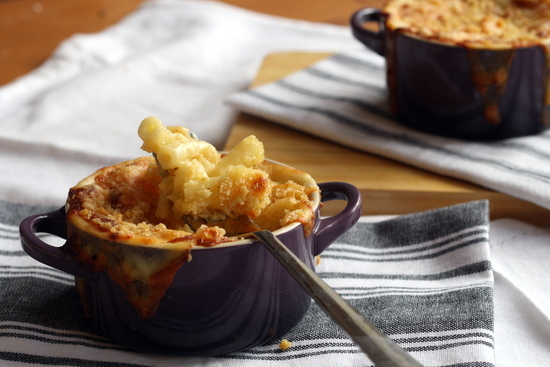 I wasn’t hugely surprised that these turned out perfectly because they’re a recipe from my absolute favourite cookbook of the moment – Heston Blumenthal at Home. Heston Blumenthal is known for his inventive cooking and scientific techniques and, while there are some recipes that I’m unlikely to ever attempt, most of the recipes in this book are happily approachable with detailed instructions and fascinating background information about techniques and ingredients. 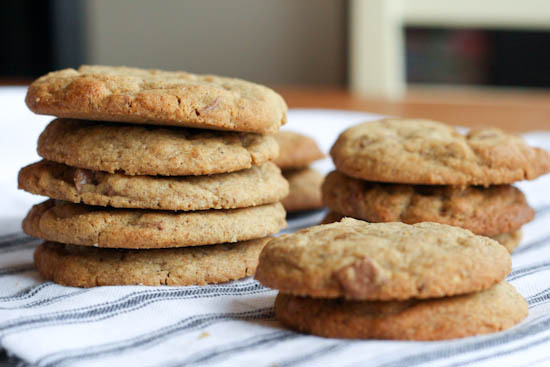 These cookies are crisp on the outside, soft and chewy on the inside. Just as they should be. There is a healthy dose of salt and a hint of depth from the instant coffee. I halved the quantities and still made 20 cookies or so. Frankly, it would have been dangerous to have any more on hand. Bring cream and syrup to a simmer. Melt the chocolate in a bain marie. Take it off the heat when melted. Combine the hot cream with salt and add to the melted chocolate 1/3 at a time, making sure to incorporate all. Allow to cool a bit before pouring onto a baking sheet lined with parchment paper. Stand at room temp for an hour then freeze until solid (about 4 hours) Remove from freezer and cut into small squares. Freeze until needed. Pre heat the oven to 190C/375F. Sift flour, salt, baking powder, bicarbonate of soda and coffee into a large bowl. Cream the (cold) butter and sugar until light and fluffy. This may be quite tricky because of the butter and so a stand mixer is probably best but I managed it with a handheld whisk. Add the egg and vanilla and keep whisking until incorporated. Add the dry ingredients and mix for 3-5 minutes until a dough is formed. At the last minute add the frozen chocolate chips and mix to incorpate. Place a ice cream scoop of dough (approx 40g) onto parchment paper with plenty of space around each cookie (I got 6-8 on a baking tray). Bake for 8-10 minutes until golden brown. Allow to cool on the baking tray before removing to a wire rack. So I like Twitter. I spend way too much time on facebook. My LiveJournal is an endless succession of half-completed to do lists. I couldn’t really get in to tumblr. Now for something new. This blog will attempt to document some of the more materialistic parts of my life. The food that I eat, the things that I read, the kitsch homewares that I try not to buy. I have a million and one ideas for posts that I mainly formulate on the tube to work in the morning so now I just have to find the impetus to actually sit down and commit the words to a page (or screen).